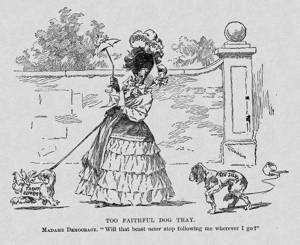 This companion cartoon to "After the Convention" imagines how the Democratic strategy of leading with tariff reform during the 1892 presidential campaign is dogged by the untamed issue of free silver. Published shortly before the Democratic National Convention, it revealed the possibility that advocates of an inflationary money supply would push through a platform plank endorsing the unlimited coinage of silver at a 16 to 1 ratio with gold. Another possibility was the nomination of a presidential candidate perceived as more open to the silverites than was Grover Cleveland, a gold standard backer. The former president believed that his New York State nemesis, Senator David B. Hill, was eager to fill that role. The teakettle tied to the mutt’s tail was a common symbol for a problem that was sure to trip up its wearer. In this case, it indicates that the Free Silver mongrel will impede the carefully controlled plans for tariff reform.